In this newsletter, you’ll find essential oil blends for supporting digestion. Isn’t it interesting how our bellies can communicate so much to us? They are quick to tell us when something is not quite right. Our stomachs tell us when we’ve eaten something that doesn’t agree with us. We might feel nauseous or get cramps. If we are stressed, our stomachs sometimes speak up. Have you ever used essential oils to support your belly? It’s incredible how effective they are for this! There are a wide variety of essential oils that can help, too. Some of my favorites are Roman Chamomile, Sweet Orange, Peppermint, and the “spicy” essential oils, like Cardamom and Ginger. They are all especially good at calming tummy troubles—whether that means indigestion, nausea, cramps, or nervous tension. I included an entire chapter about digestion in my book, The Heart of Aromatherapy, and I’ve shared a recipe from there for you in this newsletter. You’ll also find information about Cardamom essential oil (including a class I recently taught all about Cardamom! ), a Belly Spasm Oil recipe, and more. Enjoy the recipes (and maybe sip a cup of Ginger or Peppermint tea while you read)! This recipe comes from my book, The Heart of Aromatherapy. In the book, I had fun turning the essential oils into characters who made their own recipes. This is one of Basil’s! 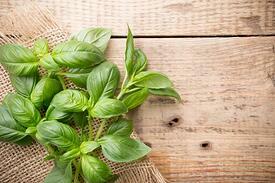 Sometimes Basil has muscle tension in multiple places at once, such as in its belly and head. Taking deep breaths of this inhaler helps Basil release that stress and relax. 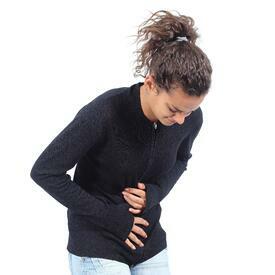 Use this recipe: to ease an upset stomach and a headache at the same time. Add the essential oil drops to a blank Aromatherapy inhaler. Use it as needed to calm indigestion or nausea. 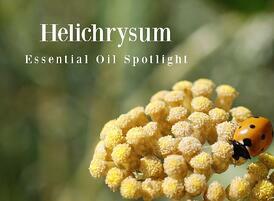 Out of all the essential oils I know, Helichrysum is one of the most experienced healers. It knows how to heal bruises, wounds and skin issues, and how to reduce scar tissue. It also knows about reducing inflammation, swelling, muscle and joint pain, and even respiratory issues. Helichrysum is an expert in many kinds of cellular repair. One of the places it grows is the island of Corsica. When I was there visiting my friend, a distiller named Michelle, she told me that Corsica has been fought over many times, and both the land and the people have experienced many war wounds. She feels that Helichrysum grows all over the island in such abundance to help the people who live there heal from the wounds of these wars. That’s such a beautiful expression of Helichrysum’s personality. In this Spotlight, I’ll share some recipes for gentle healing with Helichrysum, including a face mask, injury oil, and body butter. Too Much Food? Make an Inhaler for Digestion! Attending NAHA’s annual Aromatherapy conference is a beautiful opportunity. Not only do you get to take a fun trip to a beautiful place (in this case, Salt Lake City, Utah! ), but you get to expand your knowledge about natural healing in a BIG way, while connecting with natural practitioners from all around the world. Learn about herbalism and reflexology, talk to Massage Therapists and Aromatherapists from different countries, attend presentations about research, take part in fun workshops, and MORE! There will even be a wellness exhibit trade show so you can see what everyone is up to. I like to think of NAHA’s annual conference more like a big Aromatherapy party! 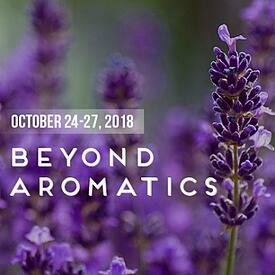 While NAHA’s focus is Aromatherapy (they are the National Association for Holistic Aromatherapists), they’re expanding their focus with this conference. Hence the title, Beyond Aromatics: Ancient Wisdom to Modern Science. This is a great place to network, expand your knowledge, and be inspired. Want to come to the party? See the conference schedule and register here! Kateřina worked for pharmaceutical companies for five years, before realizing she wanted to learn more about the natural approach to health and well-being. This eventually led her to study with Aromahead! She also studied in London and the south of France, where she was able to visit distillers and gather wild Lavender in the mountains. Kateřina started Aroma Ateliér, and became a distributor for Florihana in the Czech Republic. She leads workshops and classes, and creates her own essential oil products and cosmetics. She’s even been hired by cosmetic companies to create essential oil blends for their products, and has been featured in the Czech version of the magazine Marie Claire! Her website is so beautiful, and she’s doing incredible, important work in guiding others on how to use essential oils safely. Congratulations on a dream come true Kateřina! Exciting Announcement: Live Aromatherapy Webinars! It’s nearly my favorite time of year again, when I’ll be hosting a series of a series of special essential oil webinars for audiences all around the world! I call this “webinar season” but it might as well be my birthday for how excited I get. Truly! And it’s not just me either. The whole team at Aromahead gets involved in helping to create + share these fun online mini-classes. Today, I just want to give you a little sneak peek at what will be happening when we kick-off in just a few weeks! We reach over 60,000 people during the 2 weeks of webinars. Students participate from countries all over the world. I will be making essential oil chemistry fun + simple and telling stories about a distiller I’ve visited in France. Whether you’re new to Aromahead or have been a part of our community for a while, I really hope you’ll choose to join one of our FREE webinars when the invitations go out in the next few weeks. Essential Oil Spotlight: Cardamom Class! There is so much to know about using Cardamom essential oil . 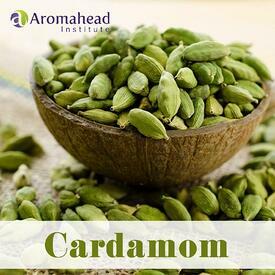 . .
Cardamom has “multiple personalities.” It’s comforting, energizing, warming, supports immunity, eases digestion, encourages circulation, relieves pain, and clears congestion.
. . . so I recently taught an Aromahead class entirely dedicated to Cardamom! The Cardamom Spotlight Webinar was a HUGE success! Everyone had a great time and learned how to use this spicy essential oil SAFELY. We studied 4 recipes and 12 additional oils that blend well with Cardamom. And good news! I recorded the webinar—you can still take this two-hour online immersion class! Class is just $35. The recordings include a Q&A that I held after the webinar, important safety information, Cardamom’s #1 use throughout history, and more. Click here to learn more about expanding your confidence with this dynamic, spicy, versatile essential oil! If you make videos and want to learn techniques like how to make editing cuts, how to remove or insert clips from your video, and more, I think you’ll appreciate Openshot. You can use it to make professional-quality videos, even if you’ve never edited a video before. Openshot was originally created as a free video editor for Linux software way back in 2008 (a long time ago in “technology time!”) The software proved very popular, and 10 short years later it’s also available for Macs and Windows . . . but it’s still FREE to download and use! Openshot lets you work with different audio tracks and video tracks, and helps you merge the two together. (So if you have a microphone setup that’s not directly connected to your camera, you can sync the two recordings, audio and video, into a single track.) You can also make different kinds of editing “cuts,” like fading out or sliding into the next scene. And if you want to play with fun features like slow motion, changing your video’s coloration, or even removing the background, Openshot can help you do that. Openshot is great for businesses—it even lets you overlay a logo or text onto your videos. You can find easy-to-follow tutorials on YouTube that take less than 10 minutes to watch, and then you are on your way! You can learn more about it on their website, Openshot.org. This belly spasm oil is a great friend if your stomach feels sore or tight—whether it’s from stress, or you’ve eaten something that’s just not agreeing with you. Our belly spasm blend has a shelf life of two years. Are you feeling like it’s time for a snack after so much talk about digestion? I’m going to indulge! I’ll just be sure to keep my Basil inhaler close by to support my belly while I eat. See you next month!